We attempt to speak about Krishna, but what can we really say? We memorise a few verses and recite them like a parrot, and that is the extent of our glorification of the Lord. Where is our inner feeling? Everyone goes around talking about raga-bhakti, but where is that spontaneous feeling that is the meaning of raga? Sri Caitanya Mahaprabhu told us to follow some simple rules, the rules of vidhi-bhakti. He said to chant the Holy Name, to chant a lakh every day. This happened in Puri when all the brahmanas there started to invite Him to accept dinner at their homes. So Mahaprabhu answered that He only ate at the houses of millionaires, which in Bengali is lakha-pati. All the brahmanas were disappointed to hear Mahaprabhu say this, because they were all very poor. Then Mahaprabhu laughed and said, You know what I mean by a lakha-pati? I mean someone who chants a hundred thousand Holy Names every day. The brahmanas were immediately relieved and said, Is there anyone more merciful to us than You? You devise strategies like this to get us to chant the Holy Name. Of course we will chant a lakh every day, but please accept our invitation! Srila Prabhupada also told us to chant a lakh every day. Many of our godbrothers went to him and said, But Prabhupada, we have to do so much service. How can we chant a lakh every day? Prabhupada never said, Just chant as much as you can. That is enough. He said, Make the time. Somehow or another, find the time. I heard him say this myself. But we don’t. We can’t find the time to chant. This is the extent of our capacity to do bhajana. And yet we still think that we can talk about raga-bhakti. All these Western devotees who come here hear about something called raga-bhakti and immediately think that they understand everything there is to know about it. But they really know nothing about the qualifications that are needed to attain raga-bhakti. They don’t understand. This is why I have spoken about all these matters from the Srimad-Bhagavatam. vidhunoti suhrit satamHearing and speaking about Lord Krishna is a most pure activity, for as you engage in such activities, the Lord Himself enters your heart and destroys all the causes of inauspiciousness that are obstacles to your spiritual life. This is how Krishna acts as a friend to the pious. When all causes of inauspiciousness or anarthas are almost completely destroyed through regular service to the devotees and hearing the Srimad-Bhagavatam, then one comes to the stage of steadfast devotion to the Supreme Lord, Who is glorified in the best of poetry. hridaye nahila rasa bindu guna maniOne may complete chanting a lakh of Names on his japa-mala, O Lord, but still not get a drop of the Holy Name’s ecstatic taste. The reason is that while chanting, the mind is wandering all over the place, thinking of so many different things. What is the point of chanting the Holy Name a million times if you still don’t experience krishna-prema? Is this raga-bhakti? Is this what raga-bhakti looks like? Will a raga-bhakta have no taste for chanting the Holy Name? 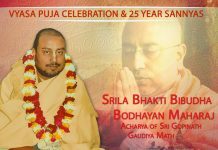 Where is the attachment to chanting the Holy Name? You can’t catch a worm and yet you think you can go cobra hunting? You talk to these people about developing affection for the Holy Name and they treat it as though it were irrelevant. They are attracted to the stories of girls, but they don’t realise who these girls are. Radharani is Krishna’s personal potency, and the gopis are all Her expansions, extensions of Herself. Therefore it is said that Krishna is not engaged in dalliances with anyone but Himself. He is the self-sufficient Supreme Lord, and all these gopis are not separate from His essence. There is no falldown, no question of material lust. The Bhagavata (10.33.25) uses the term avaruddha-saurata to indicate that no gross sexual activity is involved in the rasa-lila. Therefore, Sridhara Svami concludes that the rasa-lila is Krishna’s lust-conquering pastime. There is not the slightest trace of material lust in the activities shared by Krishna and the gopis, not the slightest tendency to selfishly seek the gratification of their own senses. We will not be able to understand this. Therefore, we must listen carefully from our spiritual masters in order to understand what qualifications are needed to enter into the Lord’s joyful world of play. 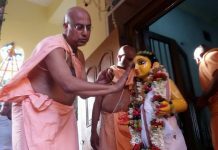 Mahaprabhu Himself relished such matters in private in the Gambhira with His intimate associates Svarupa Damodara and Ramananda Raya. There were no worldly-minded people present when these discussions went on. But what are these people doing? They say this is Radha-kunda, Radharani’s realm, but how many of us can really live in Radha-kunda? How many of us are even able to take the dust of Radha-kunda on our heads? We have to take these things into account. Do we dip our hands in the holy water of Radha-kunda only to shake it off again? Srila Prabhupada used to tell a funny story about an opium smoker. The sun was setting and this addict felt the need to satisfy his addiction, but he was on one side of the river, while the village where there was fire to light his pipe was on the other. Our situation is something like this. We want to be united with Krishna, the Lord of Goloka, but we are separated by a raging river of disqualifications. We have to bear all this in mind. 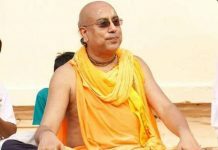 We can dive into Radha-kunda as often as we like, drink the water, submerge ourselves in it, but that does not mean that we have really bathed in Radha-kunda. What we really have to do is plunge into the waters of Radharani’s mood of spontaneous devotion, and to do that we must first develop enthusiasm for Krishna’s Name. Without such enthusiasm, nothing further will be gained. This is the teaching of Sri Caitanya Mahaprabhu. When the sun of prema rises, then all the darkness of sin and suffering dissipates. This means lust and all it entails. This is how Visvanatha Cakravarti Thakura awards eligibility for entering the rasa-lila, but that does not take place until one has attained raga-bhakti. Muslims are also listening to the rasa-lila while puffing on a bidi or some other weed. Such people are heard to applaud and ask the speaker for an encore, Keep on speaking. Keep on speaking. What is going on here? It is their material lusts that are being awakened, not any real mood of devotion. One cannot steal one’s way into the highest stages of spiritual life. We must earn the right to enter the realm of Divine Love.